Gerrit Adriaensz. Berckheyde was born in Haarlem in 1638 into a family of artists. He trained with his elder brother, the architectural painter Job Berckheyde. Together they made a lengthy trip around Germany along the Rhine, visiting Cologne, Bonn, Mannheim and Heidelberg, the city where they worked for the Elector Palatine, Charles Louis. The Berckheyde brothers shared a house and probably a studio. Both worked on the genre of architectural paintings and influenced each other throughout their careers. Gerrit Berckheyde specialised in the depiction of urban views whose accuracy recalls the work of Saenredam. He painted monuments and large buildings located in ample squares in compositions that convey a sense of spaciousness and clarity. He thus differs from the other leading Dutch painter of urban views, Jan van der Heyden, who preferred narrow, angular views seen from canals. Berckheyde’s paintings are marked by their topographical character, apart from those of the city of Cologne in which real buildings, depicted on the basis of sketches made at first-hand, are combined in an imaginary manner. 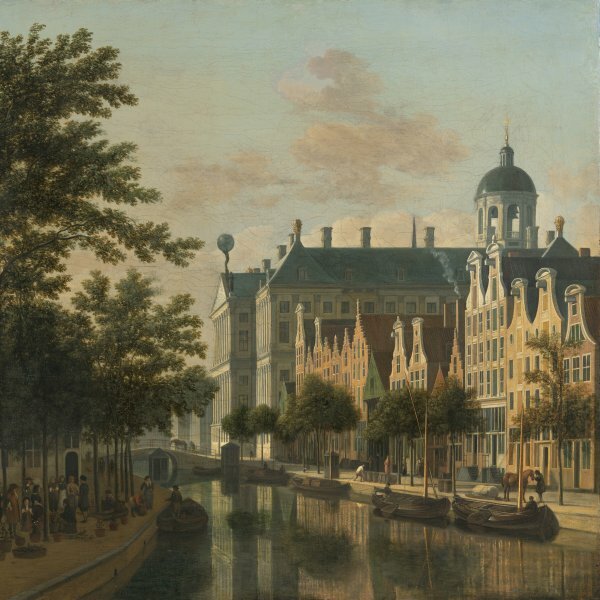 Among his most frequently depicted themes is that of views of Haarlem, which provide a documentary record of the city at that period, and of the Amsterdam Town Hall. Like his brother, Berckheyde painted views of church interiors. From 1661 to 1681 the artist was a member of the society of rhetoricians in Haarlem known as De Wijngaardranken, while between 1691 and 1695 he was an official in the guild of Saint Luke. Despite not having an organized workshop or pupils Berckheyde’s work was extremely influential for other painters of urban views such as Timotheus de Graaf, Jan ten Compe and Isaac Ouwater.